Start learning how to play music today, with the book and DVD set. Have you taken traditional piano lessons but feel limited because you can only play what you read? Or do you play by ear fairly well but have no basic idea of what you're doing? Or are you a musician with who wants an easy way to express your ideas on the keyboard? Whatever your level and interest, music should be easy to grasp and understand. However, since it is traditionally taught in tandem with notation- which is a language unto itself- many students get lost in the sheet music and never learn the actual language of music. In The Key of One we don't use notation so we can focus on learning the basic principles of how music works. Without the pressure of learning notation, the simplicity of basic music theory can be revealed: every major and minor scale in every key relates to one common formula. If you choose to learn notation, you’ll do so with a true understanding of how music works. And if notation isn’t your thing, you won’t be locked out from the creativity, expression and fun that music can bring to your life! Comprehending notes, chords, scales and modes. Easy patterns to get you playing in every key right away. Learning the simple formula for how music is made. Basics of understanding music as a language. Understanding the role of time in music. By designating a starting note as ONE, the correct notes of the scale are instantly apparent and you're free to play in any key immediately. Remember, there are only twelve notes but there are many combinations and relations between them. Even with so few notes, there is a lot of overlap in how they relate to each other. By understanding this one simple formula, we can unlock the basic building blocks of music, making it easy and fun to learn how to play. The freedom of being able to express yourself on an instrument will give you boundless opportunities to perform the music you want to play and even make up some of your own. The information is simple, but when buried under the task of learning the language of notation, it's almost impossible to see. We separate the song from the sheet music and teach you how to hear it, understand it and play it as freely as the language you speak. Once you learned your ABC's and 123's in elementary school, you moved on to a lifetime of thinking, speaking and expressing yourself. Music is a universal language that everyone should be able to speak! 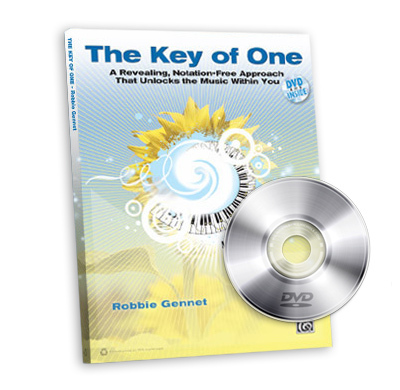 In The Key of One, we learn the fundamental ABC's of music so you can begin your own lifelong musical journey. The piano has remained unchanged since the days of Beethoven and Bach and so has the 12-tone musical scale. Those 12 notes relate to each other in a variety of predictable and formulaic ways that never change, giving you a solid foundation for your musical aspirations. It is my goal to open the language of music to anyone who wants to learn it and I hope you are inspired to create and play the music within you. Thanks, Let The Key of One get you ready to rock! "We've hesitated to review this, as the author is a regular Keyboard contributor and we didn't want to be making a shameless plug for one of our own. But this visual and sheet music-free method for learning to play keyboards is so effective and downright fun that we're doing you and him a disservice to stay mum any longer. 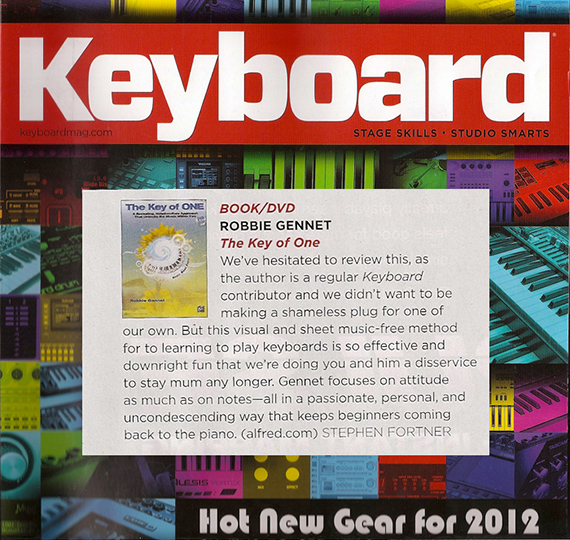 Gennet focuses on attitude as much as on notes--all in a passionate, personal and uncondescending way that keeps beginners coming back to the piano." "Some people think music education is a privilege, but I think it’s essential to being human."